Life’s pains, disappointments and frustrations jockey for your attention. They push, persuade and punch, hoping to dull your spirit and dim your glow. In every moment, you have the ability to create your outlook and your reality. You, alone, select the paint and design for the canvas that is your life. You have the beautiful opportunity to choose. Faithfully choose to see the good, minute-by-minute. Rather than withdrawing and retreating, fight positively for what you desire most. With every intentional choice, you build momentum and you become stronger at seeing and manifesting even more good in your world. Know that what you want is just on the other side of this obstacle, and understand that a dark day does not make for a dark life. Take one step of faith today, electing to see the good that is all around you. 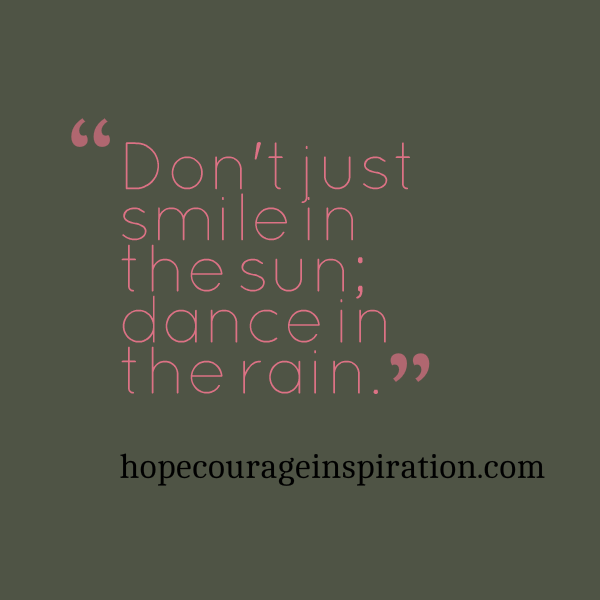 Don’t just smile in the sun; dance in the rain.